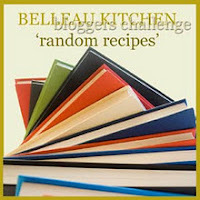 Dom of Belleau Kitchen has introduced a little twist into his Random Recipe challenge for this month, namely that we should randomly select from someone else’s books rather than our own. So I borrowed a recently published, glossy cookbook by a well-known author. And then it all went wrong. Most of the offerings in the book turned out to be rehashes of well-known recipes. That was disappointing enough, but then I started to spot errors, such as ingredients listed but not mentioned in the method and vice versa. But it was the book’s endless gush of self-congratulation that meant I really couldn't face selecting one of the recipes for the challenge. My mother always told me that if I can't say anything nice, then I should shut up. So I returned the book from whence it came while smiling sweetly and looking grateful. While thinking what to do instead I realised that there was a book which I’d borrowed some time ago and, errm, which still seemed to be on my shelf. So I randomly opened ‘Indian Food Made Easy’ by Anjum Anand (a very much better book than the rejected effort) and found the recipe for Fennel Seed Drop-Biscuits. To be honest, there are three recipes on the selected page, but, since I'm deeply fond of the taste of fennel, I just couldn't resist this one. I do remember the original TV series, but, for some reason, I don’t remember this recipe. I'm happy to say that it’s simple and very tasty. Although inspired by a deep-fried and probably more complicated original, these are essentially sweet and fragrant drop scones. Like pancakes, it’s one of those recipes that’s just plain good fun to put together in a warm kitchen on a cold winter’s day. You can find the recipe on the BBC site here. If you're unlucky enough to have been reading this blog for a while then you might have noticed a certain obsession with French baking and you can’t wander through the world of French baking for too long without falling over a macaron. Everyone must be familiar with the modern macaron, beloved of fine patisseries everywhere, but there are more traditional versions of the almond cakes which turn up in various places around France. Amiens, Reims, St Emilion, St Jean de Luz, Montmorillon, Cormery, Melun, Niort and Nancy all have their own versions and that’s just the ones I can think of for the moment. There’s a vaguely plausible theory that macarons may have been baked first in ancient Persia, although there’s little doubt that they arrived in France via Italy. Cormery claims the oldest recipe - allegedly dating from the 8th century. The Cormery macarons are ring-shaped – well, the shape of a monk’s navel if you believe the legends. Montmorillon boasts a museum dedicated to the almond and the macaron. Macaroons arrived in England a very long time ago – for instance, there’s a mention of them in ‘The Queen-like Closet or Rich Cabinet’ of 1670. That’s enough facts for now – I'm getting a headache. There are plenty of macaron (or macaroon) recipes around and I hesitate to add another to the pile but I'm going to anyway. This recipe is my general purpose traditional French macaron recipe. It's a really simple version that, shall we say, evokes the spirit rather than tries to be exactly like any of those I've mentioned. Let’s pretend that this recipe is closest to the St Jean de Luz version, even though that’s almost certainly not true, because it does give me an excuse to include a picture of that pretty little town and imagine I'm there rather than here in the cold murkiness of an English winter. Incidentally, I have been known to bake a vaguely authentic version of the macarons from Amiens and I promise to post that recipe as well before too long. These macarons keep pretty well and, I think, actually improve with a day or so of sitting in an airtight tin. Depending on how big you make them, this will produce between 20 and 25 macarons. They go really well with strong coffee. Preheat the oven to 160°C. Cover a couple of baking trays with silicone sheets or non-stick paper. Whisk the egg whites to the soft peak stage. Gently stir in the sugar, followed by the ground almonds. Mix the vanilla and almond extract into the honey and, again, gently stir into the mixture. Place spoonfuls of the mixture onto the prepared baking trays. Shape them into rounds and flatten the tops a little. You can vary the size but I reckon that something like a tablespoon of mixture per macaron is about right for a decent bite or two. Bake for 10 – 15 minutes. The macarons should be relatively lightly cooked – a golden brown but not a dark brown. Leave on the trays to cool for at least 10 minutes before transferring to a cooling rack. Store in an airtight container once cold. Rumour has it that we've started a new year and so there are probably quite a few people making resolutions to be good or, at least, to be careful about what they eat. So it seems a good time to write down my favourite recipe for low-fat cake. Over the years I've tried many variations on this recipe but this very simple version is the one I usually come back to. This loaf cake has no butter or oil and no eggs. It doesn't even have a lot of sugar. Of course, take those ingredients out of a cake mixture and you’ll get a very different sort of texture in the finished cake. This cake has a typical fruit loaf quality – soft but chewy. I must make it very clear that you don’t have to use prunes – you could use other dried fruits such as dates. I know from past experience that many people hate prunes for some reason. Maybe they were force fed prunes as children. But personally I think prunes are deeply misunderstood and seriously delicious. This recipe will fill one 500 g (1 lb) loaf tin and you should get ten slices out of the loaf, so that’s very little indulgence per slice. If you really want indulgence, though, a good layer of butter spread on a slice should go down very well. The slices also toast rather pleasingly. Lightly butter or spray a 500 g (1 lb.) loaf tin with cake release spray. Line the base of the tin with non-stick parchment. Preheat the oven to 170°C. Sift the flour and bicarbonate of soda together. Stir in the prunes. Add the mashed banana and the golden syrup and mix together. The mixture will be quite firm so stir in enough water (don’t use really cold water) to make the mixture smooth and soft without being runny. The amount of water that you need will vary, but around 50 – 100 ml will usually be about right. Transfer the mixture to the prepared tin and level it out. Bake for 40 – 50 minutes until a knife or skewer inserted into the cake comes out clean. If the top of the cake seems to be browning too quickly, cover it loosely with foil after the first 15 or 20 minutes. Allow the cake to cool for around 10 minutes in the tin before removing and cooling completely on a rack.